Founded in 2013, Sapphire Utility Solutions has quickly become a trusted name in the utility industries; known for capabilities within the clean water, wastewater and gas infrastructure sectors, providing innovative solutions to meet clients' needs. The company's experienced team has a reputation for a courteous, professional attitude, delivering a service that exceeds client and customer expectations. Sapphire works collaboratively with clients and partners, working behind the scenes, maintaining water, wastewater and gas infrastructure. 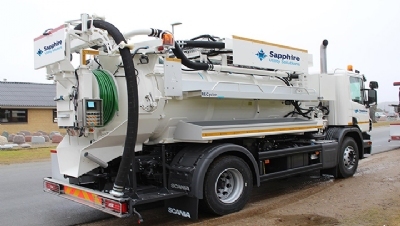 Sapphire Utility Solutions has launched the Urban Recycler, a compact, 'first time resolution' vehicle for rapid, effective gully clearing - even in congested urban areas. Developed in collaboration with JHL, the Urban Recycler, or CityRECycler® 206, brings gully cleaning and water recycling capabilities in a more compact urban solution; delivering a step-change in drain management for the utility, rail, highways and commercial sectors, with a reduced carbon foot-print and environmental benefits, due to a reduction in clean water usage and the amount of waste to landfill. The road network removes surface water through roadside gullies, many of which are decades old. The usual approach to cleaning these has been the deployment of traditional jetvac units, with limited flexibility and up to 20% of the working day lost, due to the need to draw from the clean water network or by having to take waste to landfill. However, changes in weather patterns with heavier, more intense storms, has challenged the UK highways network to develop a new approach to affordable gully cleaning. Sapphire Utility Solutions has worked closely with JHL to develop a solution that will change the way in which these works are completed. The CityRECycler 206® has full gully cleansing capability, with the urban capability of the CityFlex® (a small versatile unit, capable of working in even the most restricted spaces). Equipped with a 6m3 tank, a legal payload of 5.2 tonnes and a jetting capacity 207 l/min at 160 bars, the CityRECycler® 206 can complete complex tasks, despite its small size. The unit comes with the newest fuel-saving technology that automatically reduces the revolutions of the engine and pumps to the minimum level required for the job. A fully automated process enables the unit to shut down the vacuum pump when there is enough vacuum in the tank; significantly reducing fuel consumption and the environmental footprint of the unit. This compact unit with a rear-mounted, remotely controlled boom has been fitted with boom jets and offers full recycling. This reduces clean water usage by 32% and waste to landfill by 18%. For more information please visit www.sus.co.uk or come and see the Urban Recycler on booth A40 at Utility Week Live (NEC, 23-24 May).